Little Rock AFB is located just northeast of Little Rock, Arkansas, the state's capital and largest city. The host unit is the 19th Airlift Wing of the Air Mobility Command 21st Expeditionary Mobility Task Force. The mission of the wing is to supply the DoD with the largest C-130 Hercules transport fleet in the world. 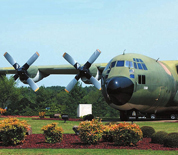 All operations supporting the C-130 can be found at Little Rock including pilot, navigator and flight engineer training, humanitarian mission support and operations involving supply and troop transport. Places of interest near base include the Little Rock Zoo, the Big Dam Bridge and the Riverfront Park, where the Riverfest music festival is hosted annually. This Little Rock AFB directory features the critical info you’ll need to navigate through the many facilities and recreational opportunities available on base.